Rated 5 out of 5 by SmokeyMtnLinda from What a fun game .. I'm loving it!!! Finally one of those Arcade-Shooter-Time Management type games that have a easy mode for the ones of use who like to play their games a little slower and be able to finish it. It's funny, too. It sure had me laughing and perked me right up. Just wish the music had a few more notes, but that is easy to fix. Try it ... you might like it! Thanks BFG!!! Rated 4 out of 5 by kateblue222 from Not a bad little time killer As someone who still plays the original Plants vs Zombies almost every day, I thought this game was a nice change. Yes, it it very like PvZ. You are trying to keep groupies from overrunning a rock and roll star. In order to do this, you buy money trees. When they leaf out, you harvest the money leaves. After you harvest money from your trees, you plant water guns and other items to scare off groupies, who, after a time, run away. If you fail to make them run, Shannon herself performs judo-esque moves on them. There are also money bags that fall from the sky. They will fade if you don’t collect them fast enough. A roadie will upgrade your plants for a price, but the method is confusing. You have to click on the plant in advance or nothing happens. The game pauses while you upgrade. 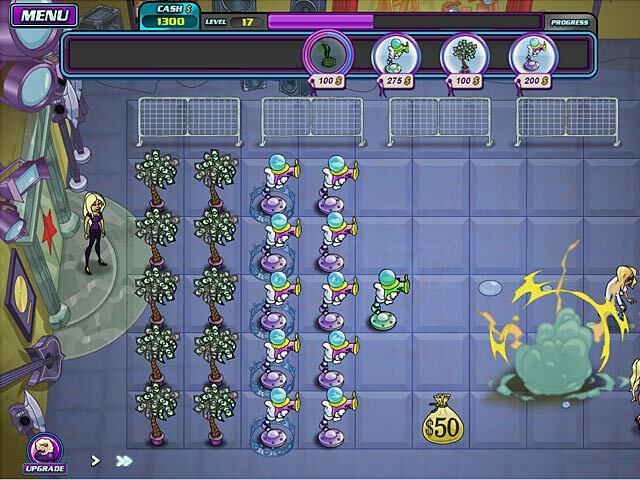 The method is much easier than having to use a shovel to dig plants up and then replace them with different plants as in PvZ. And PvZ doesn't pause while you replace a plant. So this is a much better system once you figure out how to get it to work. Upgrading a water gun causes it to fire bigger blobs of water. I have not figured out the percentage of improvement upgrading gives, but I am sure it scares off groupies faster. I figure it is like exchanging a PvZ peashooter for one that shoots two peas. The roadie will also buy back your plants back at a discount. This should come in handy in later levels when the game is more difficult. Yes, this game is awfully easy, as far as I have gotten. I even stopped and set it on the harder setting, and it was still easy. But I haven’t gotten too far. I am sure it will get harder. And I am a PvZ expert. Interesting and beneficial differences from PvZ include: 1. Shooters shoot more often as groupies get closer. 2. Money trees produce more leaves if you wait for a few seconds. As the game gets harder, the ability to harvest early may really help in emergencies, but you should usually wait so you can harvest more money. 3. There’s a map so you can go to any level if you have passed it. I wish PvZ had this feature. Some of my favorite PvZ levels can only be reached if you play the whole game again, and then you only get to play them once. 4. There's a harder setting. PvZ could benefit from that, too. Annoyances: 1. The money bags disappear when you click on them. At first, it was unclear to me if I was getting to them too late, or if they just needed a graphic or a sound to show you got them, like the sunflowers floating up to the counter in PvZ. As it turns out, the money counter goes up, but I had to concentrate on the counter to make sure this was happening. 2. The music. Cannot understand this. There must be hundreds of great Kiss guitar licks that could have been used, but the one they picked (if it is a real Kiss lick, even) is boring and annoying. I had to turn it off. 3. The sound generally. I can’t understand what the Sharon character is saying. Voice needs to be louder in relationship to the other sounds. With the music on, it’s really hard to hear. 4. It's kind of ugly. PvZ was cute. Maybe this is partially responsible for the bad ratings. I’ll be buying it, at least as a daily deal or during a good sale. 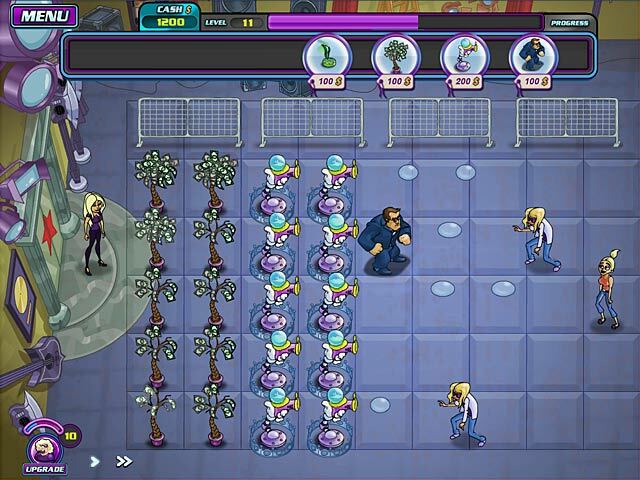 It’ll be worth it--a change from PvZ for this PvZ addict's daily fix. Rated 4 out of 5 by PrettyBlueEyes78 from While I'm not a fan of Kiss, Gene Simmons, or Shannon Tweed.... I actually had fun playing the game. The platform (as you probably saw in other reviews) is like Plants Vs. Zombies which is probably why I enjoyed playing. I absolutely loved P vs. Z. There are 2 modes, easy & normal. As you play you unlock albums that are loaded with photos of the Tweed-Simmons family. Not professional shots that I've seen so far, but actual photos from the family albums. That should be a plus for fans. I actually watched an interview with Shannon Tweed, where she explains the choice of storyline. Believe it or not there are still groupies after Gene Simmons ( I know a few uberfans myself). Despite what some may think, the game isn't about killing women. One of the tools used is (spoiler alert?). a machine that shoots water at the groupies to wash their makeup off and a sort of stink bomb that makes them smelly. It isn't gory. They don't lose body parts like Plants Vs. Zombies. Essentially, this is Shannons way of fighting back the women that are after her husband, in a spoofy way. When one looks at the game from that perspective they might not be so hard on it. Shannon actually does the voice for her character, and so does her daughter Sophie (I think that's her name?). All in all I had fun playing and bought it. It isn't the same caliber as P v. Z BUT for her first try I think Shannon did a good job, and the cartoony style and chasing off stupid groupies make it all the more fun. I would recommend this game for fans of P v. Z style games, and/or fans of the Tweed-Simmons clan. Rated 3 out of 5 by leilanibz from Average game This review is based on the 1 hour demo. I played the entire demo, and it wasn't bad. The object of the game is for you to place objects in the way of attacking fans so they don't get to your rock star. Your weapons are sticky gum, smell bombs, water balloon shooters, money trees, and other silly weapons. I found that each level was fairly formulaic; I would place down two money trees and then start building my water balloon launcher walls. After that it depended on which characters were in the rows. Slow moving zombie-like fans needed a stronger launcher against them, so I would upgrade those launchers first. I would also toss stink bombs here and there to push groups back. The storyline is somewhat cute. At different points in the game, you meet the different fans and get to know their backstories. As you unlock different weapons, you get a funny blurb about how they work. Overall, it's not a bad little game. I would strongly recommend play the demo before buying this game. Rated 3 out of 5 by ivillagegrinch from Plants vs Zombies, but lacking brains I really wanted to like this game because I enjoy watching the exploits of the Tweed-Simmons family on television, but this has very little of Shannon's charm or Gene's "larger than life" personality. All we have is a poorly drawn version of "Plants vs Zombies". I'm really on the fence if I want to spend the money to get it, so I'll probably wait until it's the Deal of the Day. Rated 3 out of 5 by kimberlyt83 from Nothing special This game is nothing special. Don't waste your time. Rated 3 out of 5 by mygames49 from THIS IS FOR ARCADE LOVERS IF YOU LIKE ARCADES GAMES THIS IS FOR YOU. I LIKE IT BUT NOT ENOUGH TO BUY IT. WHEN IT BECOMES A ONLINE GAME FOR BG I'LL PLAY IT OFTEN. Rated 2 out of 5 by Myca666 from If you like it slow... I usually like games where you can relax and dont pose too much challenge, but this was slow, even for me. On each level the same strategy was good enough, with only 1 tree/row I got way more money than needed. After I upgraded all my shooters I just sat back and waited for it to end - most times it did not take even the half of the level. So I was just sitting out the other half of it. You can switch on "easy" mode, but I dont see the point. The game is easy enough on normal. The idea is not bad, but the game is still boring. I tried to give it many chances but I stopped playing it after lvl 22. Wish the music was diffferent, as well. It is as repetitive as the levels themselves. Rated 2 out of 5 by Iceshark39 from Sub-par at best I, too, really wanted to like this game (having loved Plants Vs. Zombies), but upon getting into it, it lacked even the challenge of the base level of Plants. I found the music to be annoying and repetitive and the 'verbal slings' were campy at best, insulting at worst. I honestly couldn't WAIT to un-install it.